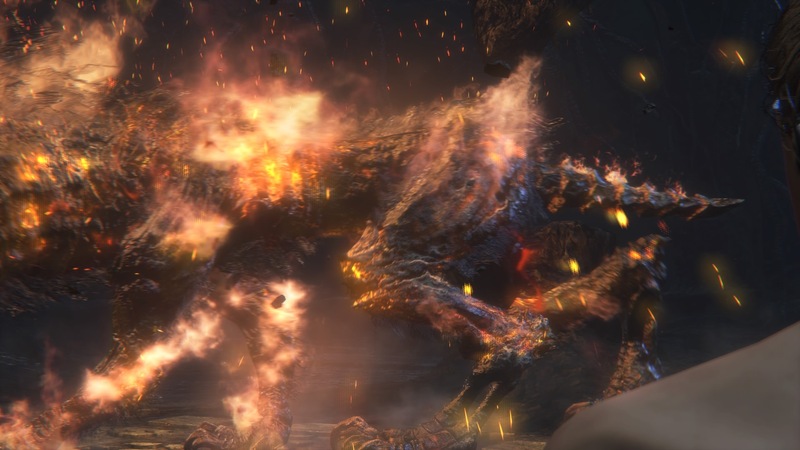 Watchdog of the Old Lords is a Boss in Bloodborne. 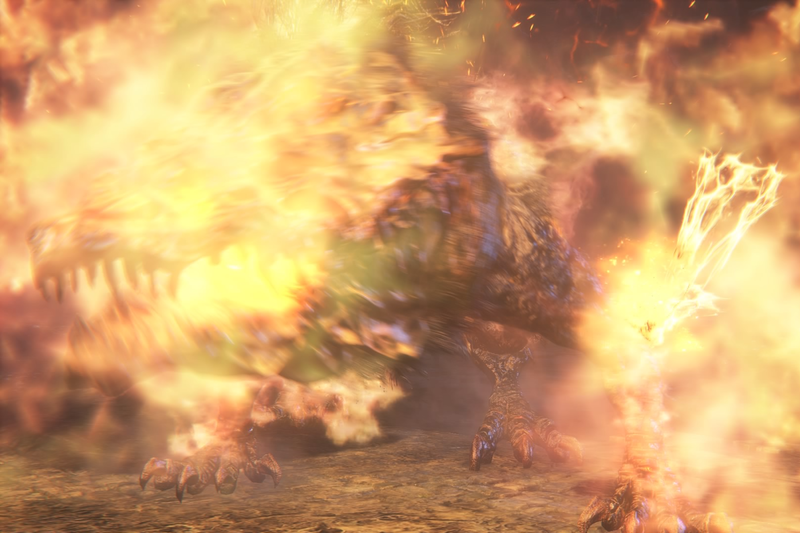 It is a large hound looking creature that is on fire. 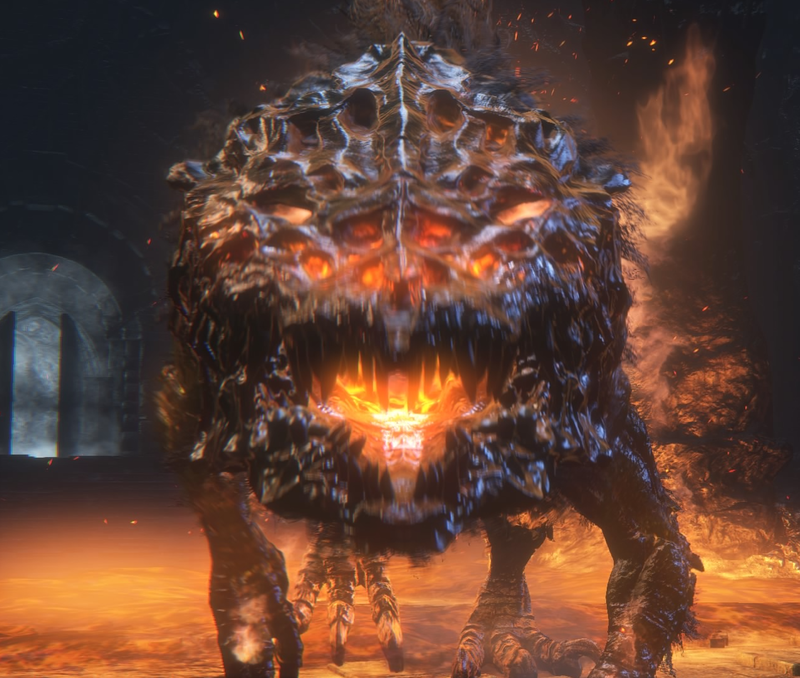 It was seen in the Chalice Dungeon gameplay video, and currently can only be found within Chalice Dungeons. Striking his knees enough or hitting them with a strong charge attack will cause them to shatter, briefly stunning him. Attacks on a broken leg will deal increased damage, however breaking a leg will seem to increase the frequency of certain moves. His head can also be broken with enough damage, causing him to take much more damage from attacks. While stunned be very careful that you don't stay too close to him. When he gets up he'll do a burst of flame that deals high damage, followed by a charge. Always dodge in the direction that he swings his head. Alternatively, bait him to swing his head or bite, and then reach him by dash jumping, leave a couple swing before he slams the ground with AoE explosion. --Holy Blade+9 and Evelyn+9 strategy (by Mr. Fluffybottom)-- This strategy yields the quickest damage that I've found (high skill + bloodtinge preferred). Lock on and stay in front of him. You will be focusing on his head. Keep Ludwigs Holy Blade in 1-handed mode for quicker attacks. Bait his biting attacks, paying close attention to whether he is doing a single or double bite. Wait until the last bite and dodge-step forward and strike him once in the head with the holy blade. Backstep out of range and repeat. If you're quick enough and have his animations down you can usually hit him once before the bite begins and again when it finishes. In between bites he will occasionally try to pepper you with small fire blasts from his claws and mouth. Backstep repeatedly to avoid these and then return to baiting his attacks. He will also occasionally vomit up a puddle of magma. As he begins gagging you can rush in and hit him a couple times before backing off. Be mindful of the puddle's location afterwards as the damage and stun-lock from it will wreck you. If you have enough phys%-up gems on your holy sword you should be able to break his head in time for stage 2 by focusing solely on it. When this happens he staggers. Hit him no more than 2 times and back off. He will do an AoE attack upon stagger recovery which can easily one-shot you if you get too greedy. He will now take increased damage from all attacks on his head. 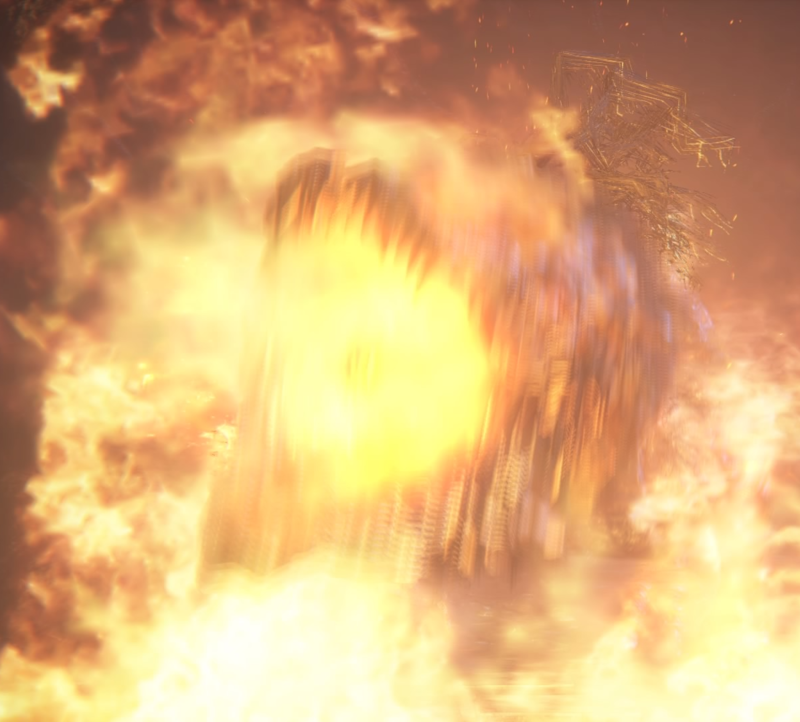 Upon entering stage 2 (~70%HP) he will erupt flames from his body and become more aggressive. His bites will often be a 2-chain instead of a single so watch for the telltale movement before approaching for a hit. In addition, he will begin including a 3rd bite attack occasionally where he will snap forward at the player in a diagonal motion. This always goes to the player's left, so sidestepping to the right as it happens allows for 1-2 hits before he pulls back. His pepper breath attacks will happen more often now and include more hits, so watch yourself. Additionally, he will begin using is AoE attack occasionally instead of just when staggered. Backpedal when you see the cinders swirling around him or die. Finally, when he approaches stage 3 he will begin using a charge attack (the same attack he likely opened the fight with). He announces this by stopping, spreading his legs, and roaring. He then swings his head down and lunges forward. This is a do or die moment for this fight. You can avoid this by sidestepping to the right in the moments before impact. If you dodge too early he homes in on you. Alternatively, you can take these charges as an opportunity to parry if you've broken his head already. Pay close attention to his movements when he sets up for the charge. As he roars and brings his head down there's a slight pause where he tightens up his legs before lunging at you. As soon as he begins to lunge after this you can shoot him in the head to parry. He will fall to his knees and be vulnerable to a visceral attack to the head. Whether you dodge or parry is up to you and how comfortable you are with your timing. If you miss the parry the charge may easily one-shot you or leave you with a sliver of health at most. High risk, high reward. Alternatively, for Arcane users, once he has 50% HP left, spamming A Call Beyond combined with Bloodbullet will make this fight almost trivial. Finally around 30%HP he enters stage 3. He erupts flames again and speeds up all of his movements. He will become extremely aggressive and begin charging more often. He will also begin using a more powerful AoE more often. It has more range than before. Backpedal as far back as possible when you see him charging it up. Being near the center WILL kill you. 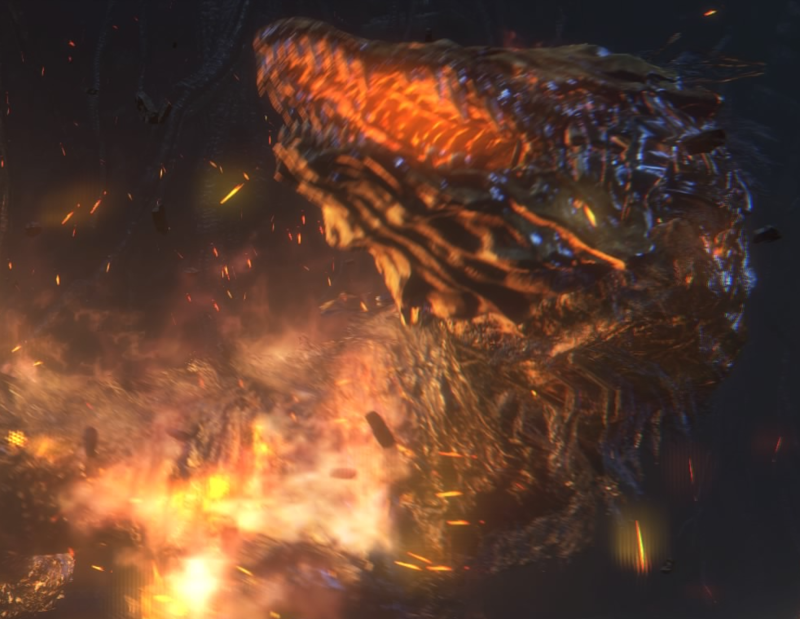 His bite chain will always be 3 hits now and he will tend to use his fire blast attacks more often. They will have increased range and duration so be wary. At this point in the fight it may be wise to focus on shooting his head when he's walking towards you if you have any bone ash. This will speed up the last portion of the fight up. Beyond that, just keep peppering him with hits in between his attacks and you should be victorious. Does a wide swinging bite from right to left, or left to right. Avoid by dodging towards this attack. Occasionally will follow up with a bite in the opposite direction or a larger strike. Slams down with his upper body. Tracks the player, wait for him to start coming down and then dodge to the side. Can occasionally do this twice in a row. 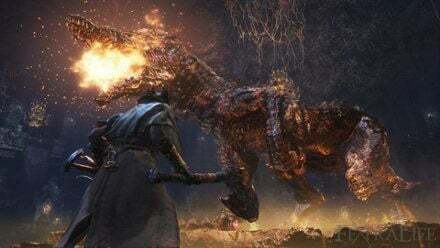 Boss will vomit up a large puddle of flame that deals minor damage. Good opportunity to break one of his legs. Boss will stomp around repeatedly, doing a small AoE around each stomp. Once a leg finishes stomping, it wont be stomping again for a while, you can tag it if you are near. 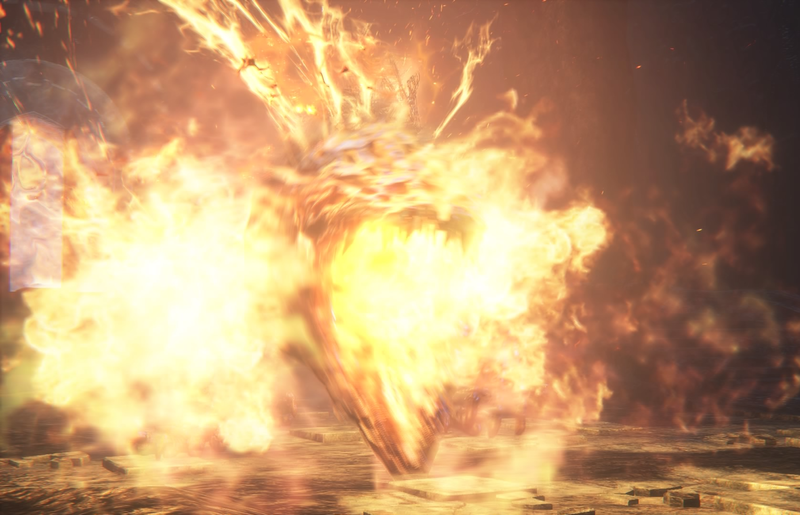 Boss rapidly creates bursts of flame in front of him. Tracks the player and has a large AoE, if you're hit by this it's likely you'll be combo'd. Dodge backwards if you see him start or to the side/forward if you're caught in it. Swipes up to two times creating a long range flamethrower-like projectile that deals high damage. Dodge through or back. At about 40% or below life, he will start using this move occasionally. It covers a large portion of the area and deals high damage. It also repairs any broken parts on his body. The Watchdog has several eyes inside his skull. The Watchdog has molars, consistent with both dogs and humans. Its still not determined what it started out as. It has 5 fingers and 3 toes. In the hind legs the tibia and fibula are exposed. The Watchdog has a powerful exoskeleton made from bone and unknown parts.